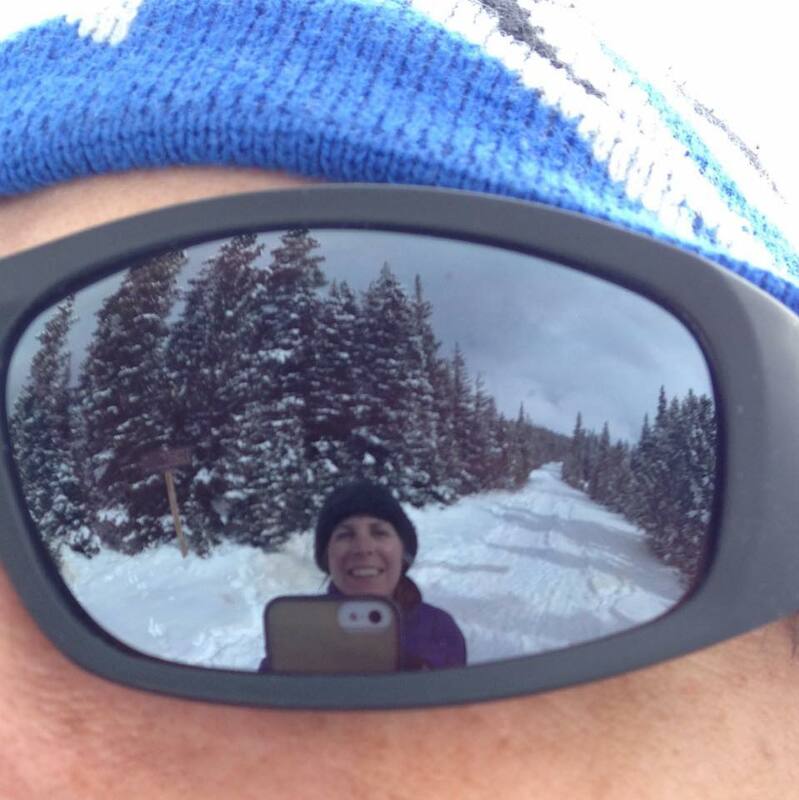 Jessica and I snowshoed at Brainard Lake Recreation Area on Saturday Feb 28, 2015. It was a beautiful day with little wind, some early sun, and stunning scenery. The area received a lot of snow recently, so conditions for snowshoeing were excellent, but all the snow made for somewhat difficult snowshoeing in stretches. We arrived at the Brainard Lake winter parking area around 9:30 a.m., with the parking lot about half full. Many snowshoers and nordic skiers were milling about, preparing to embark on the day’s trek. There is a warming hut and bathrooms at the winter parking area which is convenient. With the temperature around 15 degrees when we arrived, and at an elevation of about 10,000 feet, we both wore several layers and mittens, but weren’t overly dressed. When you’re snowshoeing, fifteen degrees isn’t really that cold. 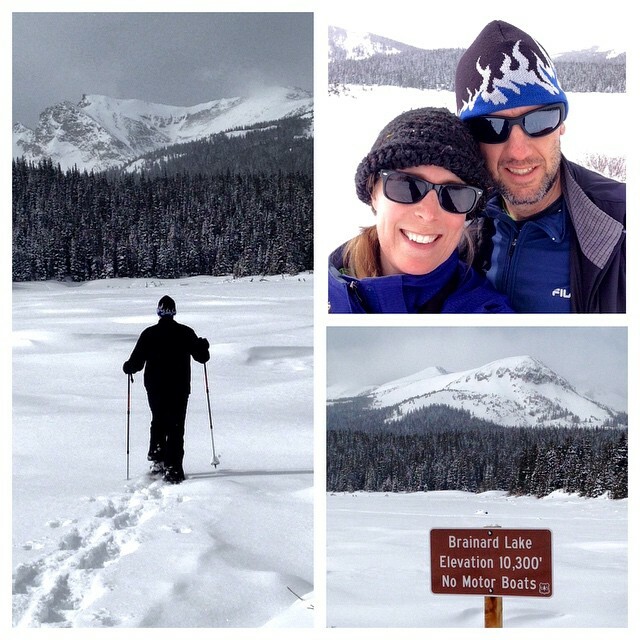 After looking at the Brainard Lake Ski and Snowshoe Map, we decided to take what we thought would be the “easy” route, and trek the Snowshoe Trail to Brainard Lake. The trails are maintained by the Boulder Colorado Mountain Club and were in excellent condition. A short walk from the winter parking lot took us to the Red Rock Trailhead where we met up with the Snowshoe Trail. There are several other trails in the area, but many of them are for skiers only. Check the map for directions and instructions. 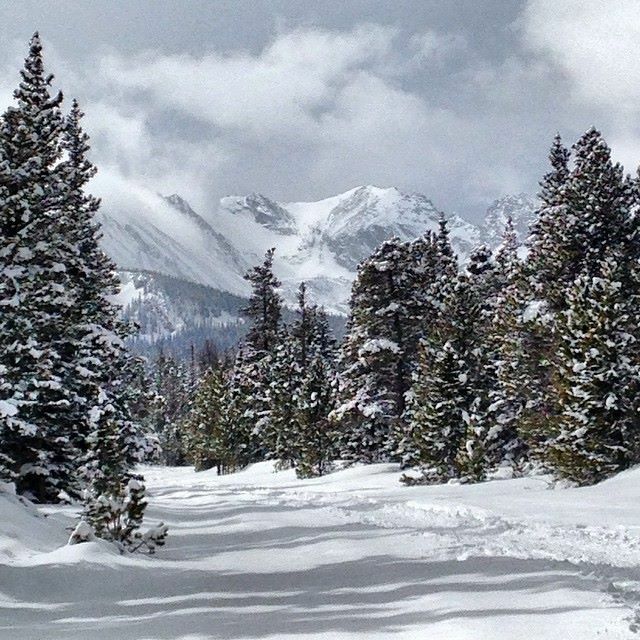 The Snowshoe Trail runs south of the Brainard Lake road for about a mile and a half, through forest, over undulating slopes, and past meadows. Words really don’t do the beauty justice. The day was still and the snow was pure. Unfortunately we kept leapfrogging a pack of vociferous women which intermittently broke the silence, but even a sailor-mouthed twenty-something couldn’t ruin the simple majesty. About half-way to Brainard Lake the Showshoe Trail crosses Brainard Lake Road, with a short hundred yard walk along the road. At this point you can continue along the Snowshoe Trail on the North side of the road, or take the road a shorter distance to the lake. We chose the trail and immediately had second thoughts. The trail is another one and a half miles to the lake, and much of it seemed to be uphill. Jessica was struggling, I was feeling it too, and we contemplated turning back. Our previous longest snowshoe trek was only a couple miles in Rocky Mountain National Park, so we were moving into uncharted territory. To make matters worse, we had forgotten to bring any food and were both already hungry. We pressed on however, and soon reached the Pawnee campground. The Snowshoe Trail gets lost in the campground somewhat, so we just followed the two men who had just passed and who looked like they knew where they were going. In the event, we ended up just doing a big half-loop around the campground, and the party behind us followed us and were just as disappointed as us to have taken the unnecessary detour. Soon though, we were back on the trail, which was relatively flat at this point, and not too much later we reached Brainard Lake. There were quite a few people, snowshoers and skiers, at the lake, soaking in the awesome. As Jessica and I sat on lakeside bench, the Indian Peaks rose in the distance, the lake was frozen over, and we daydreamed about cheeseburgers. I walked out on the frozen lake, as many others were doing, we rested a bit more, then turned to make our way back. Our trek back we took along the road, which made the return trip shorter and somewhat easier. It was unimaginably beautiful in places, the snow was more packed making the snowshoeing easier, and we stopped to identify birds (of course), talk to the occasional passerby, and fill our selves with the soulful spirit of the mountains, the snow and the world around us. By this point, Jessica was being a real trooper, and I sauntered ahead, both of us ready to finish. The round-trip was five and a quarter miles, and we tore into the mandarin oranges when we reached the car. The parking lot was full at this point, we took one last look, and we were off to find our cheeseburgers.